Reviewing the press on Sunday’s VDV meeting on Poklonnaya Gora, one could say there’s an inclination to dismiss it as the howling of old cranks who don’t constitute an organized challenge to anything or anyone. But behind that initial take, some media saw palpable discontent among officers, both retired and active duty. Nezavisimaya gazeta suggested there might be more below the surface of this rather feeble demonstration – either more powerful interests or much larger numbers of affected individuals. Ekspert concluded, at a minimum, the whole episode might lead Defense Minister Serdyukov to take the opinions of officers more seriously. The VDV demonstration goes back to the 30 September Seltsy incident, and the Russian Airborne Union’s (SDR) call for Serdyukov resign for insulting Hero of Russia, Colonel Krasov as well as for destroying the army. Kommersant put the number of participants at about 1,500. Retired General-Colonel Vyacheslav Achalov and other organizers threaten to resume protesting on 17 November if President Medvedev doesn’t fire Serdyukov. 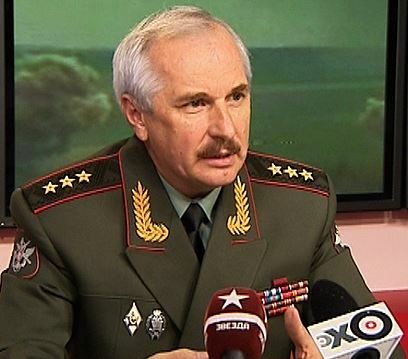 They also want General Staff Chief Nikolay Makarov, Deputy Defense Minister Nikolay Pankov, and Main Personnel Directorate Chief Viktor Goremykin to resign. The conspiracy-minded protesters maintain that Vladimir Shamanov’s crash was no accident; they think someone tried to kill him since he’s the only man standing in the way of the VDV’s ruin. So the Defense Ministry didn’t think the protest was helpful, but they also think 7 November is still a holiday. The last is the best though. Exactly when, where, and how are opponents supposed to raise their objections? When everything’s over and done with? Another insight into current regime thinking about the proper interaction of politics and policymaking . . . none. Nezavisimaya gazeta was most interested that it wasn’t just the usual non-systemic outcasts at the VDV rally, but Just Russia (Справедливая Россия) flags showed that some of the official opposition was there too. Federation Council Speaker and Just Russia leader Sergey Mironov was once a VDV senior sergeant himself. NG sees SR trying to play an army card to its advantage while remaining part of the official opposition. Novyye Izvestiya describes Poklonnaya Gora as quite the retrograde affair replete with Soviet flags, and the usual representatives of the radical opposition. The paper concludes VDV veterans believe only military men can solve the army’s problems, the army needs to be mobile and highly capable, and it shouldn’t be shameful to serve in it. At least everyone seems to agree on the last two. He went on to say that even if they are silent about Serdyukov and reforms in exchange for today’s higher officer pay, it doesn’t mean they’ve been suppressed. A key element of Serdyukov’s reform is basically tripling officer pay, and this higher pay is already a serious factor in calculations about serving, but it hasn’t happened yet (except for those getting special premium pay). Nevertheless, potentially higher pay won’t automatically mean Serdyukov will be more popular, and it doesn’t mean the VDV will get over Serdyukov’s insult to one of its officers and a Hero of Russia, according to Kuvaldin. Kuvaldin reports the Defense Ministry may compromise on some of the VDV’s more specific complaints, i.e. not moving the VDV Headquarters to Ryazan and preserving the VDV Museum, but not reversing the VDV Higher Military Command School’s subordination to the Combined Arms Academy. However, possibly, the situation will force the minister to deal with officers’ opinions more attentively and respectfully. But this author wouldn’t bet on it. In a not particularly surprising postscript, the GAI stopped SDR leader Pavel Popovskikh — former colonel, VDV Reconnaissance Chief, and defendant in the murder of journalist Dmitriy Kholodov — for driving drunk after the demonstration. The story was widely reported, but an alternative version hasn’t gotten as much play. Segodnya.ru reported that Popovskikh’s friends and others say he stopped drinking long ago. The website also says Vladislav Shurygin wrote in his blog that traffic cops were ordered to stop Popovskikh and check him for alcohol, but they sheepishly released him with an apology when they found he was sober.